Knowledgeably Blockchain is slow with Bitcoin reaching 3–4 transactions per second (tps) and Ethereum cutting off just under 20 tps. Way too slow for a very fragmented peer-to-peer digital energy future. But even scaling up speed by 10 orders of magnitudes won’t help Blockchain to go into mass market for a simple reason: other technologies as PayPal, Visa etc. can do this as well. A “rule of thumb” is, that fragmentation increases by two orders of magnitude going every layer of electricity grid down. Simply explained, if high voltage transmission network (≥ 110kV grids) has about 10,000 nodes, which is the case for large power system as the Russian UPS or the PJN in US, so the distribution network will have x100 nodes and so on down to levels of private dwellings and IoT. Logically so increases the level of transaction intensity. The Fig. 2 shows the estimated retail power market transaction intensity for Russia for current market design with one utility supplying multiple consumers (B2C model) and 3 peer-to-peer market design scenarios. It is kind of surprising, but even a significant increase of market granularity could be managed within existing VISA card tech max 56,000 tps, allowing to arrange hourly billed peer-to-peer market with payment splitting country wide (1 hour / 15 min is usually used at wholesale power markets as minimal time granularity). Only if we go to Internet-of-Energy/IoT level it is likely to need more speed of up to 10 millions tps or 2 orders of magnitude improvement. However, it we look at costs we are quickly arrive at limits (see Fig. 2) as it becomes economically unfeasible to transact small amount of value between the parties as current technology. It is simply too expensive. The digital energy industry is primarily driven by Grid Edge Economics. More precisely by unveiling value of “new stranded” assets on consumer side, e.g. by Demand Response application with private households and businesses for being paid for reducing energy consumption at peak time instead of building a new conventional power plant. So that a Tesla Powerwall owner may rent it back to the grid as otherwise its capacities will be underutilized. But current costs 0.20–0.35 USD per transaction quickly becomes a barrier for market engagement of small distributed assets at high time granularity as transaction cost becomes unsustainably high compared to the value generated. Back to Russian example: for simplicity reasons sustainable transaction costs estimated as USD 750m or 1.0% of power industry turnover (It is to be noted that “sustainable cost limit” for transaction assumed not to change depending on market design as overall function of power supply remains the same from end user perspective and we want to have a more efficient market). 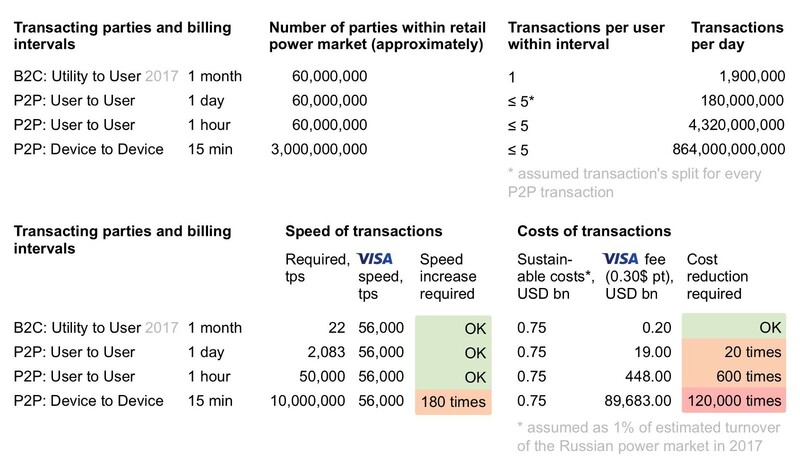 So even to allow sustainable peer-to-peer power trading hourly the costs of transactions will have to be reduced by 600 times or almost 3 orders of magnitude compared to VISA costs. But even Etherium with its 0.00663 USD pt is not good enough. Challenging task indeed. The third ingredient needed for digital application launch it is trust between parties, which are too small, fragmented and high on number that is unfeasible to come to a consensus. Not to mention that is now physically not possible to control execution and fraud by conventional means of civil legal framework. Modern Wholesale markets are used to calculate optimal day-ahead state for 1*10⁴ matrix only. Going 3 level down to IoE/IoT networks will expand this task to 1*10¹⁰ issue. The blockchain innovation, which is already there is that trust between multiple parties could be established or, better put, “replaced” by self-executing contracts (aka smart contracts), where you don’t need a middleman to supervise execution as the contract will be executed automatically once conditions match. This innovation of “trust for free” is organically embedded into blockchain design. The very number of Blockchain teams are working to hack this triple ID of mass market application. It is the challenge and privilege to stay at cutting edge of this innovations banning our own way forward with a open source solution based on Generalized State Channels building the core tech for the ØNDER blockchain commonwealth platform to be launched by Q4 2018.